About Robert Vaughan Motors Ltd.
Robert Vaughan Motor Repairs has been operating for over 20 years in Burland, and is still one of the few remaining independent garages. 16 staff are employed by the Company covering all aspects of the business from garage maintenance to courier work and a private transport service. RVMR prides itself on its professional, personal, prompt and polite service. 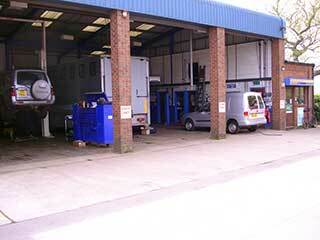 All our customers nationally and internationally are valued and treated with respect. 2015 sees ever increasing work and indeed contracts for local companies for their fleet vehicles, thank you for your custom. New ramps were added as well at the end of last year, beginning of this - all higher vehicles being able to be worked on. 2014 Time moves on and the Golden Spanner accolade working to the advantage of the garage - the database for the customers increasing and the evaluations received show brilliant and satisfied customers - always pleasing. 2013 The team now includes Robert, Dave working hard with all the MOTs, fleet inspections, servicing and contract schedules - and all the drivers for Burland - a further dozen people helping to run the Company. 2012 Sees us with a new minibus, more economical and useful for the Iveco, Fiat and County contracts as well as all our private hire. 2011 Saw Andrew Middlemiss and Peter Davies join the Burland Coaches Team although Victoria and John Langley moved on. The garage has still excellent reports from The Golden Spanner Cheshire Award - all evaluation sheets being so positive about us - thank you. My Favourite Garage and 1Link also very positive feedback. 2010: John Langley, John Barber and Tony joined the coach and minibus team as well as Victoria. All making a great contribution to the extra tours, excursions and contracts awarded. Burland Coaches, due to high demand, extended their excursions all round the country and tours to the Isle of Wight, Weymouth, The Lakes, North Wales etc. 2009: extended the fleet with another 53 seater - with 3 point seat belts and is LEZ compliant allowing us to go freely into London. Gordon joined the team. 2006: Burland minibuses expanded with the purchase of an Executive 51 seater Coach. Alex and Tom also joined the garage team. 1992 – 2002: Gradual increase in staff as the volume ofwork increased – Julie joined on admin.